The Real-Ease Neck and Shoulder Relaxer is a scientifically contoured headrest designed to let you deeply relax. 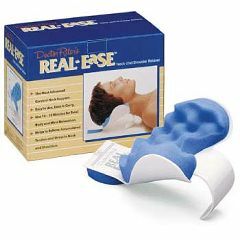 Doctor Riter's Real-Ease is the most advanced cervical neck support in the world. It is so unique that it's patented. It is totally non-toxic and is the simplest, least expensive way to deeply relax your tired, sore neck and shoulders. So why do so many people suffer from neck, head and shoulder discomfort anyway? What does the Real-Ease Neck and Shoulder Relaxer do? Imagine having a skilled massage therapist gently and firmly holding your head, while you completely surrender the weight of your head into their healing hands. This is just what the Real-Ease can accomplish for you. It allows for deep and profound muscle comfort. How does the Real-Ease Neck and Shoulder Relaxer work? The scientifically and orthopedically designed device gently cradles your neck along the base of the skull. The structure of the device allows you to deeply relax the weight of your head into the firm, soft inner surface while gently holding your head up. This allows the many tight muscles of the neck and shoulders to relax. Wherever you can lean back or lie down, Real-Ease will make it more relaxing. So order Doctor Riter's Real-Ease™ Neck and Shoulder Relaxer today- Your neck and shoulders will thank you later! Due to hygiene issues, this product is non-returnable! Average Health. uses at home in the car. Not quite what I'd hoped for, as I was hoping it would provide more of a traction effect. I primarily use this when I'm on my inversion table to increase my comfort and relaxation level. Helps to relax the neck while stretching out the back. For this it works fine, but it really only works best when supported by a solid surface; otherwise it wobbles to easy with any movement. Would I purchase this again? Probably not. Helps ease muscle tension, great at the end of the day. by farm hand from southern mo. Relaxes your entire body. Relieves tension in neck. Just a few minutes everyday makes such a difference! I often suffer from migraines and I believe it is correlated to neck pain/tension and this product helps to reduce the tension in my neck. I lost my directions. Is 15 minutes the maximum time recommended per use? Can use of this product stimulate the vagus nerve? I do not have one but I am a physician and I do not see how this product could stimulate a vagal response. Please consider that an opinion, not medical advice. Well, I bought one without enough study and would like to return it. It simply cradles your head in a stand of plastic. I'm not a doctor or a professional of any kind (other than a mother and grandmother:))but I believe the vagus nerve is in the area of the throat, so this would have no more effect on it than lowering your chin. I think perhaps the Korean people knew better how to center the weight of their bodies in their heads and thereby relax their necks and shoulders. In this case, this device would be quite helpful. I will persevere.